Qualification : (1) Bachelor?s Degree (B.E./ B.Tech.) in Engineering for Graduate Apprentice in the relevant branch with Minimum aggregate of 70% marks for GEN/OBC and 60% marks for SC/ST/PH from Institute / University recognized by AICTE. (2) Diploma in Engineering/ Office Management for Technician Apprentices in the relevant branch from Institute / University recognized by AICTE. (3) Degree/Diploma acquired from Distance/ Correspondence education system is not eligible for the apprenticeship. Note : 1. There will be relaxation in minimum marks for wards of BHEL Employees (son/daughter/spouse). 2. Candidates who have passed B.E./B.Tech./ Diploma before January 2012 are not eligible for Apprentice training. Hence, such candidates need not to apply.3. Candidates having 01 year post qualification experience or undergone Apprentices training for 01 year or more are not eligible to apply as per Apprentices Act. Rate of Stipend : For Graduate Apprentices – Rs. 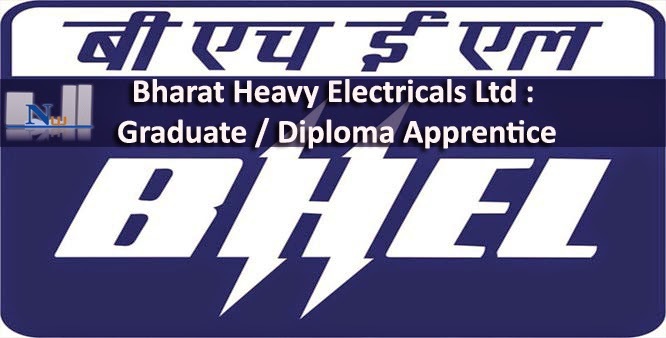 6000/- Per Month., For Technician Apprentices – Rs. 4000/- Per Month.